Let me know when you are ready to start taking orders Pixel. What is the current output of each transitor? I've been lurking for ages whilst building my arcade can. I'm edging closer to completion whilst at the same time drooling over all these awesome pin cabs. This is certainly something that I'll be keeping a close eye on as I plan my pin project over the coming months. I started this project for Chris and myself, but allready i have sold a empty pcb to someone. Don't know how many people would like it and i think it is better to wait a bit until we have more things working well, it's all very in beta phase at the moment. The max current on 1 output is 16 Amp at the moment, but keep in mind that the pcb is not made to switch all 12 channels at 16 Amps at the same time. I will make a new version for myself with only 3Amp outputs. Mixing it in the same pcb is also an option. ...And there I came... twice! Maybe with your MM video I do not even need the pantie-mask! The clicking is me punching in the characters via RS232 for the effects. Basicly i have made 8 effects, 2 for lighting 1 led for 50ms, 2 for running up the side (left and right), 2 running down left and right, 1 on the top running sideways and 1 on the bottom changing between leds. And after that did some adding in MM, sending the numbers to arduino on specific events, high loop, enter the moat, hitting troll targets and so on. Some progress made, i have 1 of the pcb tuned for 24 volt driving for my new contactors. To give some idea of the options we could have in the futre connected a few contactors and wired them randomly to the Arduino board and hitting with different timings. This one almosts sounds like starting up a real cab !! man, this is reall something! It's really cool to be watching all this progress! As you can see i am planning on 4 groups of 595's that are driven separate. one reason for that is ease of use and driving, the other speed. I have made a test setup today with 3 groups of 595's, 1 group of 4, 1 group of 2 and a single one. The writing of data to the 3 groups gets done in about 1600 microseconds (yes, micro) and i think the driving of all 4 groups will be around the 2 miliseconds in the end. I think that will be more then enought to handle all things. There is going to be some more cycles of the Arduino needed to handle the input and selecting the needed ports but i think we will be safe with that. 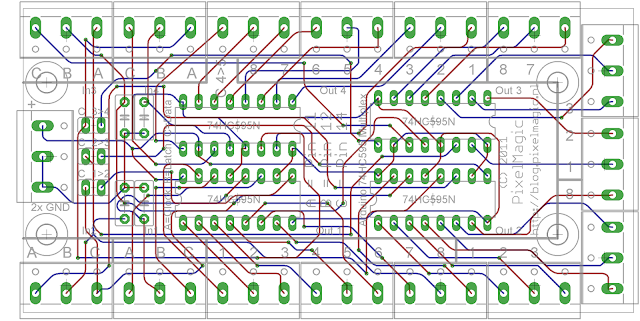 After that i designed and orderer some pcb's for the 595 multiplexers. There are going to be 4 595 on the pcb that can be driven separate or in line and even can be connected to a next 595 board. 1 board can drive up to 32 outputs to the driver boards. While i wait on the pcb's to arrive i will try to code the Arduino for further testing and setup 1 table to use all the events i am planning to build. One thing i would really like, is on startup to fire a pattern of solenoids like when a real table gets started And offcourse there need to be some animation with my backbox and the flashers. Some serious thought you're putting into this, very impressive. You would like to cnc the highscore in a wooden list after beating it ? LOL, is it possible to get this effect ROM controlled via arduino/ledwiz? With one limitation, the CNC is connected to a tattoo machine on your chest ! Got my pcb today from PMI (Pixel Magic Industries), have to say that it is extremely polished and very professionally laid out....great work sir. It's been incredibly easy to populate and solder. Should be receiving the balance of my overpriced components this week and I can finish the assembly and begin the fun. Maybe if I teach myself code I can even catch up to the rest in this endeavor (although I have a side project to test with it first). Dam, did I miss a post where these were in production already? I've had many sleepless nights reading posts and planning my build around LEDWIZ and now this! Just like everyone else I'm keen to see how this plays out in the coming months. If these are offered for sale I'm certainly in line. I asked Pixelmagic about the possibility of obtaining one of the switch boards for a side project and was able to work out a price with him. I believe if the interest is there he might be persuaded to sell them in kit form as well. Guys, before i give the answers i have contaced the administrator of the forum for permission. Will post more if that comes. PMI (Pixel Magic Industries) <- you're killing me ! !